Advieh – warm, aromatic and easy homemade Persian spice mixes for spicing up all your delicious Persian recipes. These advieh spice blends are the best ever and quick to make. Easy to store and use. I used to get so many questions about the advieh in my Persian recipes. So here it is finally! Advieh is an aromatic Persian spice blend comparable to the Indian garam masala and is used for a variety of Persian recipes such as rice pilafs, grilled meats, stews, vegetables dishes, frittatas, soups, pickles and more. A staple in Persian kitchens, this spice blend has some common ingredients with garam masala, but it is actually milder and not spicy at all. Advieh khoresht: This blend is for stews (khoresh) and is more intense in aroma and often include dried limes. This can also work as a multipurpose blend. Advieh polo or Advieh berenj: This is a blend for rice (berenj) or pilafs (polo or polow). It is a simpler blend with more floral aroma from the dried rose petals. Advieh torshi: This is a blend for making pickles (torshi). Advieh ash: This is for soups (ash). Less intense than spice mix for stews but more intense than what is used for rice dishes. And there are plenty of other spice blends. But to start with you can make advieh khoresht, which can work as a multipurpose spice. Just use less of it for rice and soup dishes. The common ingredients include cardamom, cumin, cinnamon, dried rose petals, coriander, black pepper, turmeric, dried limes, cloves and such. As with any spice blend, there are many regional variations. Some that include caraway seeds, nutmeg, star anise, angelica (golpar in Persian) etc. Apart from enhancing the taste of recipes, spices come with a lot of health benefits. They are often rich sources of antioxidants, polyphenols and other phytonutrients that have health promoting properties. Cardamom: This sweet and fragrant spice has been credited for improving digestion and circulation, lowering blood pressure, fighting inflammation. Cardamom also provides some vitamins and minerals. Cumin: This spice is popular in traditional medicine for its aid in digestion. It is known to also possess anti-oxidant, anti-inflammatory, and carminative properties. Cinnamon: Cinnamon is obtained from the bark of a tropical tree and is considered to have one of the highest antioxidant values for a spice. The spice has been shown to reduce inflammation and blood triglyceride levels. It is well known for lowering blood sugar by increasing sensitivity to insulin. Dried Rose Petals: The rose petals used for culinary purposes in Persian cuisine are obtained from a wild variety of rose. Rose petals are used in savory dishes too and lend a fragrant floral note that combines well with the other warm spices in advieh. They are also rich with phytochemicals. Black Pepper: Black pepper is supposed to have anti-inflammatory, carminative, digestive, cardioprotective and anti-oxidant properties. Turmeric: Perhaps the most popular for its health benefits, turmeric contains many compounds with medicinal properties. 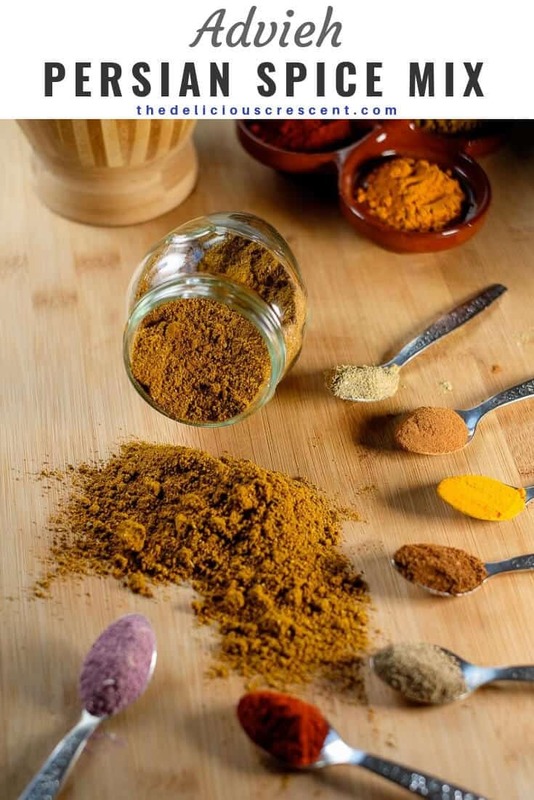 Prominent among them is curcumin, which is a powerful antioxidant and anti-inflammatory compound and is associated with healing for several disease conditions. Dried Limes: These are a staple of Persian cooking and have an intense citrus aroma. They are small limes (or lemons) boiled in brine and dried until hard. They are added whole or as a powder to stews, soups, appetizers, rice etc. Dried limes bring along the benefits of citrus. Cloves: This spice has anti-microbial properties, and is especially known for fighting oral diseases. It has been associated with enhancing the immune system, cancer prevention, and maintenance of bone health. How to use: Most spices have a long shelf life. But try to buy them in usable quantities at a store with high turnover, where it is not sitting on shelves forever. Store ground spice mix in glass containers and seal tightly. 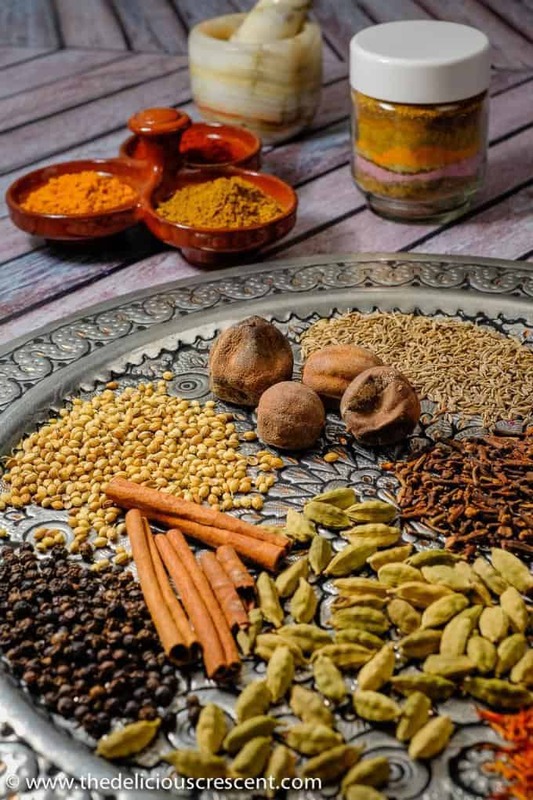 Where to buy: The best places to buy spices are ethnic stores or spice specialty stores. Indian and middle eastern stores often carry them for a much better price. Readymade advieh is also available on Amazon and at Persian or middle eastern grocery stores. Substitute for advieh: It is quite easy to make your own spice blend. However, if you run out of it, the closest substitutes would be other mild (not spicy) but aromatic mixed spice blends from the middle east or eastern Mediterranean. Advieh - warm, aromatic and easy homemade Persian spice mixes for spicing up all your delicious Persian recipes. These advieh spice blends are the best ever and quick to make. Easy to store and use for a variety of Persian recipes such as rice pilafs, grilled meats, stews, vegetables, frittatas, soups, pickles and more. Measure out the whole spices and grind them in your electric or nut grinder. You may also use a mortar and pestle. Mix the dried herbs and other ground powders into the spice blend in the final step. If you already have the ground form of the spices, you may simply combine the ground spices in the specified quantities and add the herbs. For the advieh torshi you may add the seeds (anise, nigella, celery), dried herbs and red pepper flakes to the mix without grinding. Toasting the whole spices is not typical for making advieh. But if you do, it will make the flavors a bit more intense. Don't toast the rose petals, saffron, angelica, dried limes or herbs. You can buy dried roses (culinary grade) from Persian/ middle eastern/other ethnic grocery stores or online. How to use: Try to buy spices fresh and in usable quantities at a store with high turnover, where it is not sitting on shelves forever. Store ground spice mix in glass containers and seal tightly. Where to buy: The best places to buy spices are at ethnic stores or spice specialty stores. They are often cheaper at Indian and middle eastern stores. Readymade advieh is also available on Amazon and at Persian or middle eastern grocery stores. 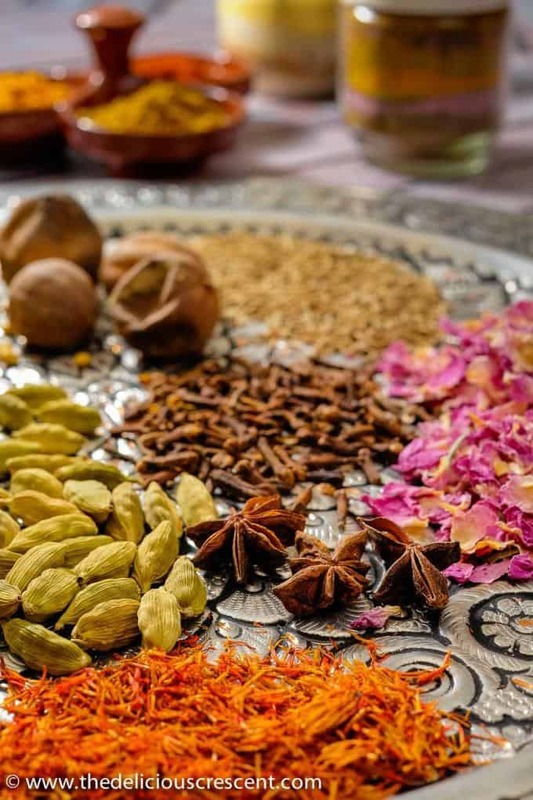 Substitute for advieh: The closest substitutes would be other mild (not spicy) but aromatic mixed spice blends from the middle east or eastern Mediterranean. This spice blend seems amazing! No wonder it is a staple in Persian kitchens. Can’t wait to try this out! Omg 😲 this is an amazing post! I love learning about different cultures and cuisines. The moment I read that it is closer to Garam Masala, I had to read the whole post. Thank you for sharing all the knowledge. I am saving this post to try sometime. Love the variation also. Thanks so much Sonal for your lovely feedback. It is like a milder garam masala without the hot or pungent spices. More like what is used for shawarma, middle eastern kebabs etc. 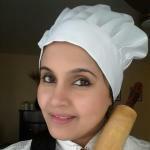 I am a huge fan of making my own spice blends! This one sounds incredibly flavorful! Pinning this to try in the future, thanks! Thanks Krisitine. Hope you like it. I too think that they turn out so much better than the store bought ones, where we have more control on the product. I had never heard of this! I love learning all of the health benefits! Thanks Kim. Makes me happy to know. I absolutely LOVE these spices in my dishes and they have such great health benefits!! I am looking forward to spicing up my rice pilaf this week for a change!! Great tips! Thanks Jessica. Hope you enjoy it!